In the late 1990s, POET — then Broin & Associates — was leading several bioprocessing facility startups simultaneously. The crew was small but mighty and dedicated. Many worked 12-hour shifts, 30 days in a row. Jim Hill was one of those crew members. Steve Lewis, Vice President of Innovation, POET Research, recalls the first time he met Hill while delivering a lever controller. Hill’s resolve to meet a challenge hasn’t changed. Those who know Hill, who is now the Automation and Electrical Engineering Manager, POET Design & Construction, speak to his commitment to the company and his never-failing practicality. He has the ability to see the big picture — and then make decisions to carry out the project, no matter what it takes. Rod Pierson, Senior Vice President & General Manager, POET Design & Construction, makes the connection to Hill’s military background: Hill has served with the Army Reserves since 1990. It takes discipline to complete a mission; the same goes to completing a project. “Jim has always had a positive view on things. He’s always looking for what’s the best way we can make this work versus making it hard to do,” Pierson said. Those on his team say he’s a good sounding board because of his downto- earth approach to situations. Hill started at Broin & Associates in February 1997 when the biofuels industry was young and full of risk, opportunity and enthusiasm — qualities that attracted talented, energetic professionals like Hill to Broin & Associates. “Really what attracted me was the passion of the leadership team,” Hill said. Hill started as a controls systems engineer working at POET - Bingham Lake. After working at Bingham Lake, Hill began working on the electrical side of the house with another new start-up in Preston, Minn. The company then was akin to today’s tech start-ups. Job responsibilities and duties flexed to meet the demands of a burgeoning company. With only nine people in the office, Hill’s job duties went beyond the confines of electrical equipment and utilities. Some days it was doing computer networking, or ordering software for computers or phone systems. Hill moved into a management role in 2004. Today, Hill oversees team members who work in electrical engineering and process automation. 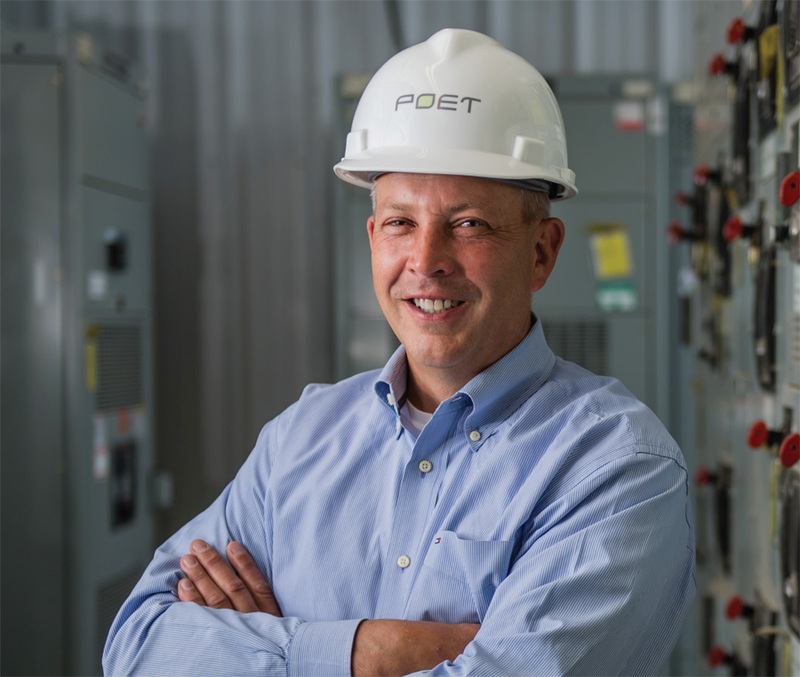 Cumulatively, the two groups have the most tenured employees in POET Design & Construction, a factor that team members say improves team cohesion. Jim Hill visits with Rachel Kloos, Plant Manager, in the electrical room at POET - Chancellor. The Process Automation team works closely with other engineering disciplines to configure the computer interface for POET bioprocessing plants to safely operate the facility automatically. The Electrical Engineering team’s vast experience allows them to engineer and design the entire bioprocessing facility from the utility substation down to the lowvoltage subsystems, Hill noted. Hill’s team is also part of the site development committee for new facilities. They look at greenfield sites and evaluate electric utilities in the area to determine which ones provide the best overall electric rates or infrastructure to those facilities. Then, the team works on engineering for the plant on both the automation and electrical side. Hill’s approach to management and his overall work style is residual from those early days when there were a handful of people at Broin & Associates, and you took on responsibilities earlier, and faster. Team members say that one of his stand-out qualities is that he trusts employees to do their jobs. Blomberg — who has worked with Hill since 2008 — recalls that Hill sent him to Mitchell, S.D., to do commissioning for the control system when he was new to POET and just 23 years old. Hill is quick to say that his team is the best part of his job. “Each day has different challenges. They make coming to work easy; they make it exciting,” he says. For Hill, his work at POET today continues to reinforce that decision to start at the company 20 years ago.